More of a barbecue taste than a cheddar taste. Not as sweet as some other barbecue chips. 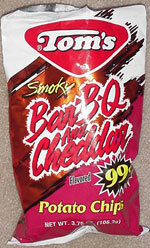 Smell test: Standard barbecue chip smell. This snack was discovered by Keith and Melissa at King Foods gas/convenience store, Clifton Park, New York.